The Associated Press is reporting the death of Ian Abercrombie, the veteran British actor best known to American audiences for playing the demanding Mr. Pitt on Seinfeld, as well as for voicing Palpatine on Star Wars: The Clone Wars. Abercrombie had recently been diagnosed with lymphoma and died after suffering kidney failure at the age of 77. Prior to beginning his film and television career, Abercrombie was an accomplished stage performer and dancer, and worked on everything from a production of Stalag 17 opposite Jason Robards to summer stock Shakespeare festivals to toiling as a magician’s assistant. He was similarly game for anything when it came to the big and small screen, racking up close to 200 credits over the years—beginning by accepting background, often-uncredited parts in films, like playing a villager in Young Frankenstein, or one of the dance marathon contestants in They Shoot Horses, Don’t They? To that end, it would almost be easier to make a list of the TV shows from 1965 and beyond in which Abercrombie didn’t make an appearance. But okay, here are some of the more famous: Get Smart, Columbo, Barnaby Jones, The Six Million Dollar Man, Battlestar Galactica, Knots Landing, Happy Days, Fantasy Island, Three’s Company, Airwolf, Who’s The Boss?, Alfred Hitchcock Presents, L.A. Law, Moonlighting, It’s Garry Shandling’s Show, Falcon Crest, Dynasty, Empty Nest, ALF, 21 Jump Street, Tales From The Crypt, Twin Peaks, Northern Exposure, Coach, The Nanny, Murphy Brown, Blossom, Babylon 5, Star Trek: Voyager, NewsRadio, Buffy The Vampire Slayer, Charmed, Nip/Tuck, How I Met Your Mother, and even Childrens Hospital. In short, if it was a memorable series from the past five decades of television, there’s a pretty good chance Abercrombie was on it. 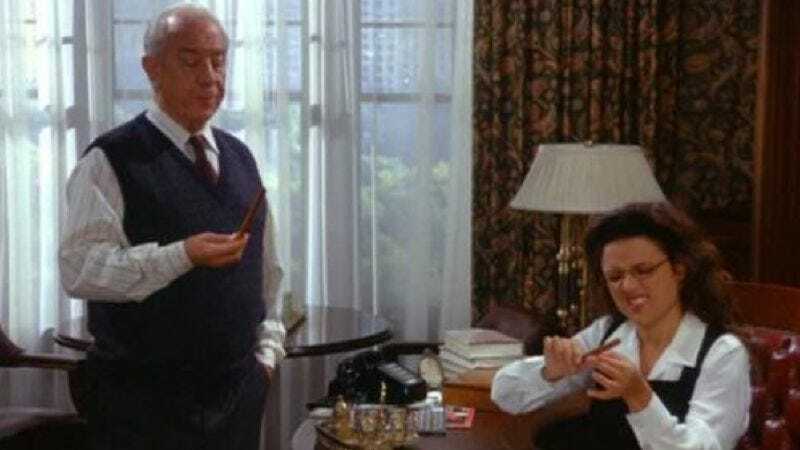 Of course, nothing was more memorable than Abercrombie’s role as Seinfeld’s Mr. Pitt, the fussy magnate who recruits Elaine as his personal assistant (after being smitten by her Jackie Kennedy-like “grace”), then proceeds to put her through the wringer with his petty, often petulant demands. Abercrombie brought out the adorably childish side in what was otherwise a very unlikeable character—whether demanding the perfect socks, regally eating his candy bars with knife and fork, gaily recounting his love for Woody Woodpecker, or even getting sucked into one of those Magic Eye posters. Abercrombie was also a favorite of the sci-fi and comic-book world, notably playing Batman’s butler Alfred in the short-lived series Bird Of Prey. In a strange coincidence, Alfred was played on Batman: The Animated Series by Clive Revill—the same actor who originally voiced Emperor Palpatine in The Empire Strikes Back, which is a part that Abercrombie would take over in his later years in The Clone Wars film and its TV and video game adaptations. (You can watch a non-embeddable clip of Abercrombie as Palpatine here.) And Abercrombie’s final role would be an episode of Green Lantern: The Animated Series, which he completed just before he died. His film career was equally filled with cult favorites—perhaps most famously his turn as the Wiseman who helps Ash return to his timeline in Army Of Darkness. Other appearances included The Prisoner Of Zenda, Warlock, The Ice Pirates, The Lost World: Jurassic Park, MouseHunt, Wild Wild West, Garfield: A Tail Of Two Kitties, and Inland Empire. Abercrombie’s most recent work included a recurring role as “Professor Crumbs” on the Disney show The Wizards Of Waverly Place, as well as voicing “Ambrose” the owl in Rango. Obviously, he was a hard-working guy and up for anything (he would have made an excellent Random Roles candidate), and that led him to rack up an enviable career full of incredible memories. Goodbye, Mr. Pitt.